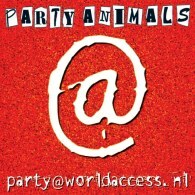 Party Animals > Video > Monus back in Mokum! After falling 20 feet out of a hotel room in Mengen, Germany, MC Monus (of Wap Squad, Flamman & Abraxas, Party Animals & Patrick Jumpen) broke his back in 5 places, his arm and his leg (and no: he wasn\'t waisted and he doesn\'t do drugs). The insurance company refused to repatriate him to Holland, but after one week of intense battle they finally caved in and brought Monus back to Amsterdam b4 Christmas!! !